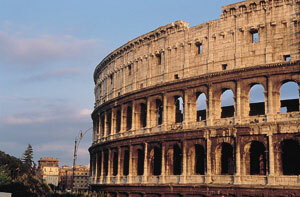 Here follows a list of information regarding the weather in Rome. Rome is famous as city of the Sun, and usually you can have sun all the day, but even in the ancient Eternal City, the rain comes! To talk of the 'weather in Lazio' is to generalise somewhat. Lazio encompasses many diverse terrains and landscapes and the rules change from one zone to the next. You can be sure that July and August will be very hot, thanks to the humidity levels that can make Rome a veritable hothouse. If you come in summer you should always bring with you bottles of water, because your tour in Rome could become really "problematic"! On the other side, if you are looking for a tan, don't worry: you'll find several ways to get it! This situation is supposed to break around the days of "Ferragosto" in the middle of August: although it is considered the hottest period of italy, this appears to be only a tradition..actually in this period the first rains are expected and with them the beginning of a decrease in temperature. On the other side, September can still be very hot with October being a fine month to visit Lazio - blue skies without the packed cities and the intense heat. November sees night-time temperatures really begin to drop, with crisp Autumn days. Winter can be cold and wet but spring always seems to come quickly. March is azalea and camelia time, while April and May are sometimes very wet months.